Only two months before Washington would burn at the hands of British troops during the War of 1812, Providence would witness the destruction by fire of a major monument atop the East Side. A victim of arson, the First Congregational Church (1795) was destroyed June 14, 1814. The structure that burned was the congregation’s second church; the first was situated on the present site of the Superior Courthouse on South Main Street. An unnamed man, presumed to have suffered from mental illness, placed a lighted candle inside one of the exterior columns. Writing 72 years after the fact, historian Welcome Arnold wrote that “it was supposed that . . . [he] wished to see what kind of a sight the two steeples would make burning and falling to the ground.” Although the town offered a reward for the person responsible, they never prosecuted anyone for the crime. The church was rebuilt soon after, designed by Providence architect John Holden Greene. The Federal-style building has classical arches and urns combined with soaring pointed Gothic style windows with delicate tracery decoration. Originally the First Congregational Church, the congregation became associated with the Unitarian movement and eventually changed its name. If the church is open, have a look inside; after taking in the spare and tasteful elegance of its interior, note the tight rectangular pews that are arranged in sequence along the ground floor and mezzanine. Spaces for contemplation and devotion? Yes, but also prime real estate in a city that was leading the Industrial Revolution and, by 1816, was well on its way toward becoming one of the most affluent cities in America. By 1910, Providence was second in the nation in terms of per-capita wealth. First Congregational Church: Samplers were a way for youth in early America to demonstrate their burgeoning skill with the needle. They typically wrought samplers that showcase Biblical verses or the alphabet. Sarah F. Sweet of Providence took a different approach. 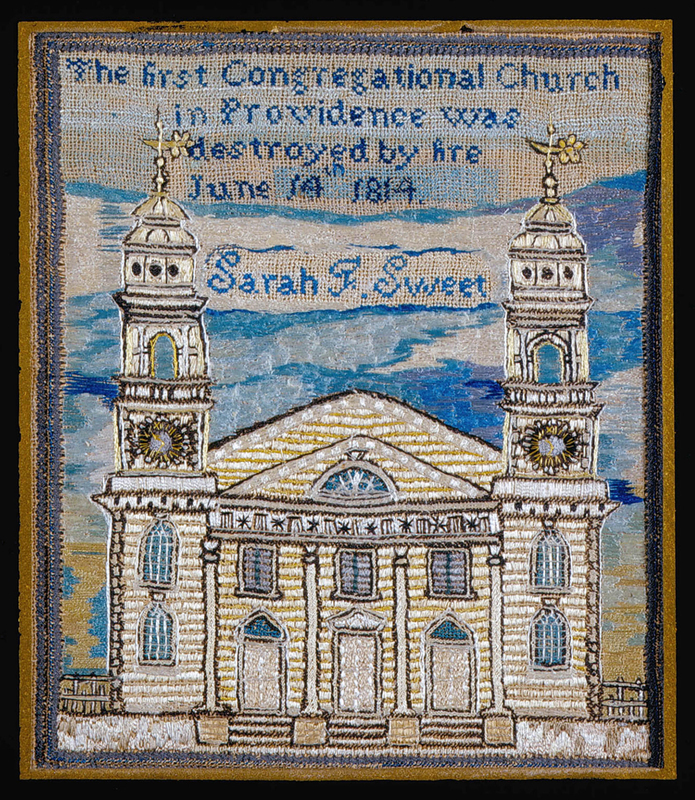 Her sampler depicts the First Congregational Church against a serene blue sky, with the following text stitched above the Church's two towers: “The First Congregational Church in Providence was destroyed by Fire June 14 1814.” Sarah Sweet broke with convention to document what could only have been a deeply memorable moment in a young girl's life. 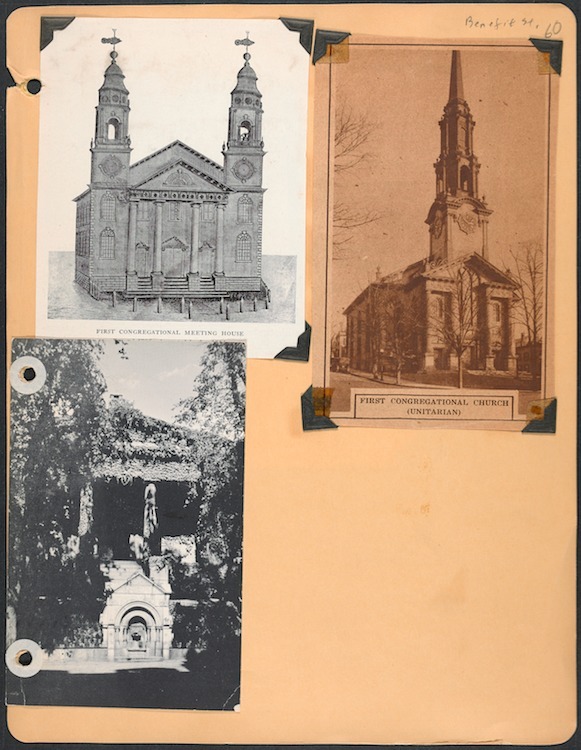 First Unitarian Church Scrapbook Page: These clippings from a John Hutchins Cady scrapbook depict the First Congregational Church and then the First Unitarian Church, which replaced it. Cady writes about these two significant churches in his seminal work of Providence history, Civic and Architectural Development of Providence, 1636-1950 (1957). First Unitarian Church Pews: This pew plat of the church interior, made in 1904, marks family ownership of pews in 1816, just after the reconstruction of the building. A veritable who's who of Providence, the pew plat shows wealthy merchant Sullivan Dorr, and father of future rebel Thomas Wilson Dorr, in the prime pew #2. Stereoview of First Unitarian: In this stereoview, taken in 1865 at the culmination of the Civil War, you can see the spire of the First Unitarian Church on the far left. Over 25,000 Rhode Island men fought in the Civil War, and 1,381 lost their lives by war's end. 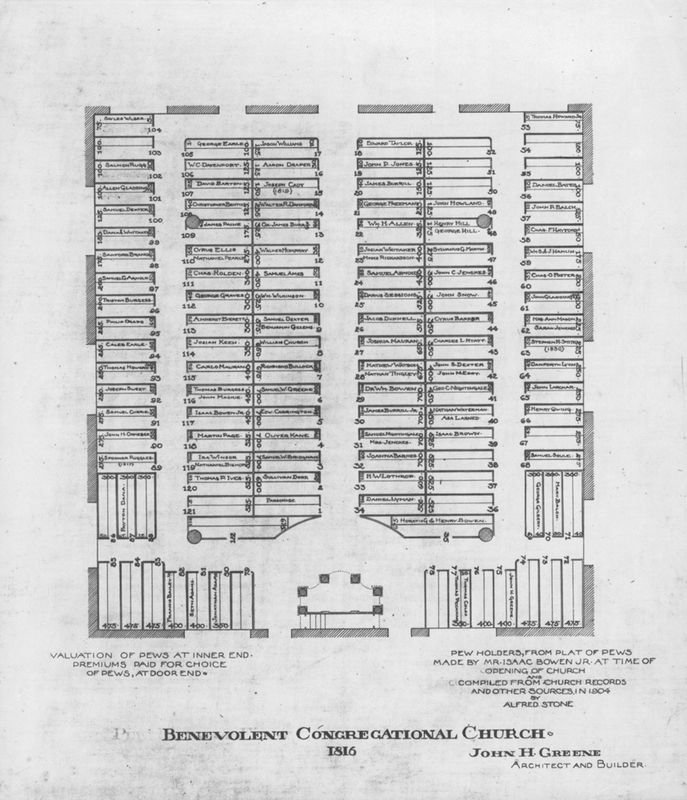 On July 10, 1770, the first pipe organ to be heard in a Congregational Church in America was played, remarkable as early Congregationalists professed themselves wholly opposed to the use of instrumental music in their churches. This c. 1811 drop-scene curtain (p. 3) is housed at the Rhode Island Historical Society’s Aldrich House on Benevolent Street. The curtain shows what the First Congregational Church looked like before fire destroyed it in 1814. Elyssa Tardif, “First Unitarian Church,” Rhode Tour, accessed April 21, 2019, http://rhodetour.org/items/show/191.